The March for Jesus, a prominent event gathering about 1000 people, took place in Gdansk, closing the Jesus Week in this city. People wearing T-shirts with evangelical messages and national symbols paraded the main streets of Gdansk. The idea of the March is to proclaim to the nation who Jesus Christ really is. “We aren’t marching to protest against something or someone. We are here because we are grateful to God and we want to rejoice and bless people” – said one of the organizers. “We live in a religious country, where everybody has heard about Jesus as a historical person, but they don’t know Him as a Savior, who can offer them life. We are wearing national symbols, because the participants are declaring that they want Jesus to be the Lord of Poland. If He isn’t Lord, someone or something else will take His place. It’s not about enthroning Jesus to be our king in the political sense, but about spiritually committing our country to God’s rule. Just like Daniel, who confessed sins on behalf of all Israel (Daniel 9), we want to invite God on behalf of the whole nation to hold the course and destiny of our country in His hand. This is the only remedy for our problems with addictions, corruption, dishonesty, confusion, broken relationships and low self-esteem of most Polish people”. The March opened with a prayer giving thanks to God for the governing authorities in Poland – the President, Prime Minister, Parliament and Senate. We prayed for God’s blessing in line with the teaching of the Bible: “Therefore I exhort first of all that supplications, prayers, intercessions, and giving of thanks be made for all men, or kings and all who are in authority, that we may lead a quiet and peaceable life in all godliness and reverence. (…) I desire therefore that the men pray everywhere, lifting up holy hands, without wrath and doubting” (1 Timothy 2:1-8). The route of the March included strategic points in the city: The Town Hall, The Marshal’s Office, The Gdańsk Shipyard, the office of Lech Walesa in the Old Town. At each of these points the participants of the March stopped to pray for wisdom and blessing for the people working for these institutions. 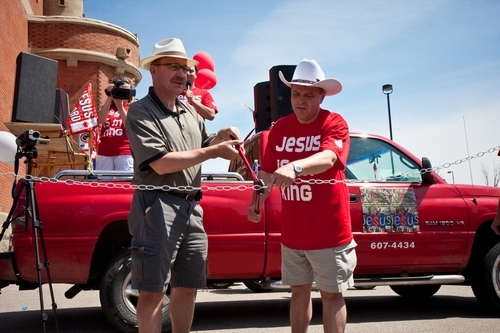 At the head of the March there was a flat bed truck carrying a worship team and the host of the event. Artur Pawłowski shared how the ancient nation of Israel joyfully celebrated their God at important historical sites (1 Chronicles 13:8). He encouraged the participants of the March to do very same thing in front of the Gdansk Shipyard, which is an important place in the history of Poland. Everybody started dancing to the sounds of Jewish melodies, rejoicing in the Lord. It was a beautiful expression of the triumph of God’s reality. The residents of the city, who observed what was happening, taking photos and filming the parade, could hear the news that Jesus Christ is interested in their life. At the same time many talented musicians played joyful music, proclaiming Christ’s victory over sin. The participants of the March greeted the people in the streets, sometimes stepping out of the parade to bless the onlookers. Most people responded by waving their hands and smiling. Going down the main walkway of the Old Town – Długa Street was a very special moment. Thousands of people stood on both sides watching the March pass by, while the worship team played such songs as: “Bless the Lord Oh My Soul”. It was a moment of profound symbolism. At the end of Długa Street, by the Green Gate, a big stage was set up, where the final events of both the March for Jesus and the whole Jesus Week took place. The Ahead of Us band started with an exciting performance. 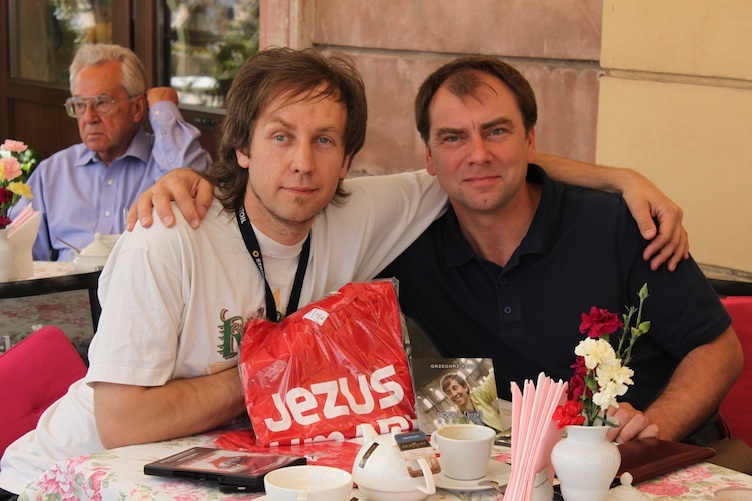 Then pastors from 25 churches from Gdansk summed up the Jesus Week. After that we could see the star of the afternoon – Grzegorz Kloc with his band. Grzegorz is an artist known from public radio and television. He played this concert to God’s great glory. We found out that he isn’t only a talented musician, but also a gifted preacher. He played music and talked about the depths of the human heart. People listened, worshiped, cried and danced. It was a wonderful worship service right in the centre of the city. One of the most touching moments was when three homeless men became convicted of the state they’re in. They asked for prayer. They confessed their sins. They kissed the Bibles they have received. During worship many people responded to the call and came forward to receive prayer. Among them was an elderly couple. The man was in a wheelchair. He asked for prayer about the strong pain in his knees. Both were believers and enthusiastic about God. The lady said that she had cancer but she overcame it. The doctors said they can find only one explanation of her recovery. “God saved you!”. After a brief prayer the pain in the gentleman’s knees receded. Everyone rejoiced in God’s goodness. On my way back I heard two young men criticizing the March for Jesus. – Why are you so critical? There is a deep significance to this event – I said. – Yeah? What kind of significance? – It speaks about the One who can change lives, about Jesus Christ. I participated once in a prayer when a person who was blind in one eye regained eyesight. He was blind because his mom was drunk when he was conceived and she was drunk when he was delivered. That’s the God we proclaim. – I’d like to pray for you. – I laid my hand on his shoulder and spoke words of blessing. – Thanks for talking to us. – He was clearly touched. “The harvest truly is great, but the labourers are few” (Luke 10:2). We need disciples in our churches, who will reach out to people to tell them about the Good News and show them what it is really about. What will you do on your watch? October 14, 2010 Artur Pawlowski Comments Off on What will you do on your watch?